Our 2019 Rainbow Run will be held April 27th, 2019. Many thanks to our team of volunteers who help make the vision of a very special day in April a reality. Your time and talents are greatly appreciated as we celebrate Abby’s colorful life. Thank you to all of the volunteers who join us in so many helpful ways each year. This special day would not be possible without you. April 27, 2019 will be a day to celebrate our Angel Abby and bring families together for a day of fun! April is organ donation awareness month. Please join us as we honor Abby’s gift of life on Christmas Day 2012. For More Information on How to become a Sponsor For Our 6th Rainbow Run click here. The Family Fun Day immediately following the Rainbow Run is FREE and for all ages. If you are interested in being a FOOD VENDOR or donate an item for our RAFFLE please e-mail 3sisters@abbysangelsfoundation.org. A 5K Rainbow Run will start the day with lots of COLOR! After the run, we will continue the celebration with Music, Food, Games, and a Raffle. It will be a day to bring smiles and laughter to all – two things Abby loved to do: Smile & Laugh! This year there will be an On-Site Abby’s Closet set up at the Rainbow Run this year. School supply donations will be accepted at this site. Most needed supplies include college & wide ruled notebook paper, flash drives, compass, protractors, college & wide-ruled composition books, pencils, mechanical pencils, 1 & 2 inch binders, pens (blue, black, red, & green ink), Crayola Crayons, colored pencils, blunt & pointed tip scissors, and tab dividers. NEW THIS YEAR, THE SCHOOL WITH THE MOST STUDENT REGISTRATIONS WINS A KEN SCOTT MAGIC SHOW!!! ALL PROCEEDS go to Abby’s Angels Foundation. Funding goes directly to: stocking supplies for each “Abby’s Closet” in area schools, outreach programs for children in the SouthMetro Atlanta area who have lost a sibling, and informing drivers of all ages about the hazards of distracted driving. This is a non-timed fun run for all ages and abilities! Strollers are allowed, but please no pets. Event will take place rain or shine. Please wear your race shirt or another white shirt to best display your RAINBOW! Race shirts guaranteed for all registrations received by April 15. The event will begin at 9:00 am with an energetic warm-up, followed by the National Anthem and Invocation. 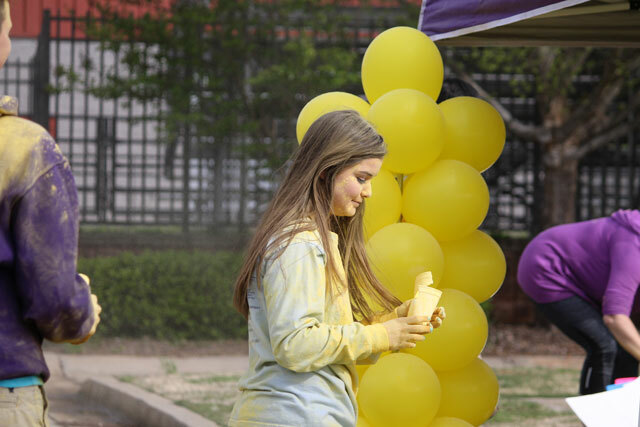 The Rainbow Run will start shortly thereafter, followed by music, food, and activities until 12:30 pm!! Download the OFFICIAL 2019 Abby’s Angels registration form HERE! Our Rainbow Run Sponsors are invaluable to the success of this annual April celebration. A very special day celebrating community and Abby’s vibrant life. Your generous support and connection to Abby’s Angels Foundation’s mission truly carries the work through the year. We humbly thank you for partnering with us to SHARE SMILES and SAVE LIVES as a 2019 Rainbow Run Sponsor.